(reflecting a higher proportion of children in the total population of low-income countries), and phosphorus content in human body averaging 470 g P per capita, implies a global anthropomass contains approximately 3.0 MMT P. The typical daily consumption is about 1500 mg P per capita for adults. This is well above the dietary reference intake (DRI), the amount human individual should take each day, as recommended by the Food and Nutrition Board, Institute of Medicine, US National Academy of Science. The US recommended intakes are 700 mg per capita for adults over 18 years of age, 1250 mg per capita for young adults between 9 and 18 years of age, and 500 mg per capita for children. A similar estimate for China is derived from a previous study: the individual daily intake of phosphorus was 1400 mg P per capita for urban residents and 1470 mg P per capita for rural residents in 2000. This exceeds the DRI of 1000 mg per capita recommended by the Chinese Nutrient Society. In addition, livestock products provided 30% of daily phosphorus intake for Chinese urban residents, and 14% of that for rural population. 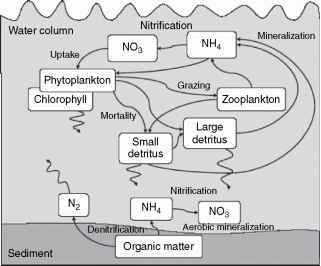 Although the phosphorus content of anthropomass is marginal in comparison with that of soil biota or ocean biota, the ecological consequences can still be significant. Given the annual world population growth of78.4 million since 2000, the net accumulation of phosphorus in the global anthropomass is around 0.04 MMT P yr-1. Compared with the global consumption of phosphorus in foods, the slight increase of phosphorus in the anthro-pomass stock implies a low assimilation rate of about 0.5%. Assuming a global average dietary consumption of 1400 mg P per capita, human excreta must have contained about 3.3 MMT P yr-1, of which urban and rural population generated 1.6 and 1.7 MMT Pyr-1, respectively. Application of human excreta as organic fertilizer is common both in Asia and in Europe, but less prevalent elsewhere in the world. The nutrient linkage between farmers and croplands has been relatively stable, but the human wastes in urban areas are less recycled than in rural areas. For instance, less than 30% of human wastes in urban areas were recycled for agricultural uses in the late 1990s in China. This percentage dramatically decreased from 90% in 1980. In contrast, about 94% of human wastes in rural areas were returned to croplands in the 1990s. In European countries, the recycling rate of urban sewage averaged about 50% over the 1990s. Globally, it could be appropriate to assume that about 20% of urban human wastes and about 70% of rural human wastes are recycled at present. Therefore, recycled human wastes amount to 1.5 MMT Pyr- . Adding the quantities of the phosphorus recycled as crop residues, animal manures, and human wastes, the total organic fertilizers applied to croplands amounts to 6.2 MMT P yr- . This is equivalent to 45% of the applied amount of inorganic fertilizers. Thus, the global input of phosphorus to croplands is probably 20 MMT Pyr-1 in total, or 1.6 times the amount of the phosphorus removed from the soil by harvesting. This leads to a net accumulation of 7.3 MMT P yr-1 or 4.7 kg P ha-1 in global soils, disregarding erosion and runoff losses.